Having been in the software development industry for 10 years now, the Iconic Solutions’ team has refined and perfected our talents in mobile app and custom software development. We’ve partnered on many technical projects over the years and we’ve been consistently proud of the level of quality we deliver time and time again. It’s not every day that we get to reflect on our growth as a company, especially because we spend the majority of our time working closely with our clients. However, since joining Clutch’s research of leading app developers in Raleigh, we’ve been able to see how Iconic Solutions compares to other firms in our field. Clutch is a verified, third-party reviews site that ranks B2B service providers according to their industry expertise, market presence, and ability to deliver quality results. Taking into account our client base, portfolio, and social media presence, Iconic Solutions received high marks across the board. But what matters the most to our score on Clutch is our client reviews. Unlike other reviews sites, Clutch actually takes the time to speak with our clients directly in phone interviews that are designed to get an accurate and unbiased understanding of their experiences working with Iconic Solutions. “I most valued Iconic Solutions’ flexibility and willingness to make frequent changes throughout the project.” – Director of Operations, Medical Device Company. We’re extremely appreciative of our clients for taking the time to speak with the Clutch team. 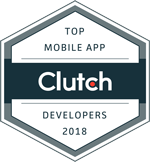 It’s encouraging to see where Iconic Solutions stands amongst other app development firms, and, in fact, our inclusion on Clutch qualified us to be featured on their sister-site, The Manifest, as one of the best software developers in Raleigh in 2018! Our position on Clutch and The Manifest is sure to rise as we wrap up more projects in 2018. Be sure to stay up to date with our client reviews by visiting our Clutch profile.